So I know this is just a picture of bread but zomgosh, it was so dericious... A slight drop of the rosemary olive oil onto the soft, freshly baked bread finished off with a sprinkle of rock salt made me feel so warm and my finger tips tingle with joy. The pork belly was a winner for me. The crackling was roasted to perfection and the pork was tender and juicy; everything melted into your mouth as soon it touched the tip of your tongue. Delicious. The Chatham Island Cod was also another one of my favourite, the meat was smooth and soft. I loved their cauliflowers and this is coming from someone who dislikes cauliflowers. The whole cauliflower was seasoned from head to toe, that is probably why I loved them so much. I am sure that everyone knows by now what my ultimate weakness is but in case if you don't, it's deep fried potato goodness. It is the one thing I can never ever get sick of. Unfortunately, the chips at Albion Street Kitchen sounded great on the menu but it just didn't do it for me. There wasn't enough crunch and seasoning to them nor was it served with a sauce.. *sad face* The garlic buttered zucchini however was the bomb and that bomb exploded in your mouth, especially if you were lucky to get some extra dollops of pan fried buttered garlic. The mains looked smaller than I predicted, especially when it was $30 each but they are more filling than they appear. It's okay though, if you are still feeling a bit hungry just order another bowl of garlic buttered zucchini. I was so grateful that everyone on my dinner table was full because it meant I could pretty much demolished this whole plate of sugary goodness myself. Mine, ALL mine... buhahaha! 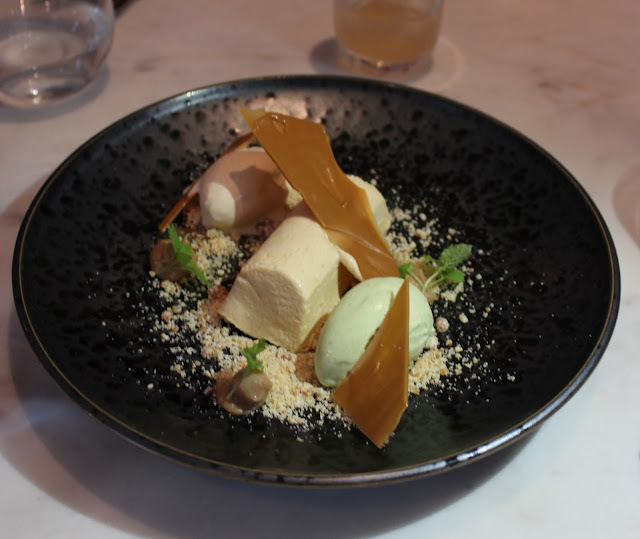 The honeycomb and the praline were seriously epic. The sweetness in the honeycomb and praline were just right, not too overly sweet. The praline was also fun to snap. Even when the praline got stuck in my teeth, I didn't mind because it was that good and I normally HATE having things stuck in between my teeth. All well worth it I'd say! What awesome food! And whoa that complimentary bread looks super tasty... Pork belly and fried potato goodness! Such a shame that Assiette has closed but the food at Albion St Kitchen looks just as good! Kung Hei Fat Choy to you too Shan Shan! Looks like there's no reason to be sad because the food at Albion Street Kitchen looks pretty damn epic! Oh man the garlicky zucchini looks and sounds soo delicious..
Food looks fantastic, although the terrine looks a bit chaotic. This one's in my list! Ooh pork belly and salted caramel sound like a match made in heaven! This is on my list! everything looks delicious... super YUM! Those chips are the same as the ones they serve at Chur Burger. Oh yum! It all looks so delicious! oh yum! so sad i never got to try assiette! Pork belly and salted caramel apple sound delish! hmmmm pork belly and salted caramel apple. Sounds delish! I was sad to see Assiette close, but nice to see it really was just a revamp to more casual and new name. Shame about the chips, but besides that the food looks great. Totally love Albion Street Kitchen. Nice to know you liked the dessert even if you "NORMALLY" hate stuff getting stuck between your teeth lol! That dessert is awesome!